Everyone appreciates a bright, white, beautiful smile. As we age, however, the enamel of the teeth often discolors from our choice in diet, oral hygiene habits, and natural wear. 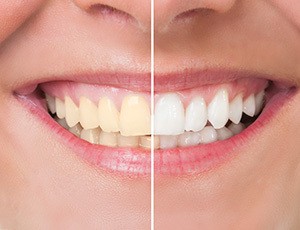 At Premier Dental Care, teeth whitening (also known as dental bleaching) is an enormously popular in-office treatment that uses bleaching agents to break apart these yellowing or staining compounds deep in the tooth enamel. The result is a change in the color of the natural tooth enamel that is whiter and brighter and greatly enhances the beauty of your smile. A take-home teeth whitening procedure typically requires two visits. In the first visit, trays will be created from molds (impressions) of your teeth. In the second visit, the trays are re-fitted and the patient is sent home with a special teeth whitening solution and instructions for wear and usage. Note: Teeth whitening procedures are effective only on natural tooth enamel. It is suggested that anyone interested in teeth whitening begin with a consultation with Dr. Bakhtyari to evaluate their dental applications or restorations (fillings, crowns, bridges, etc.) before a whitening procedure is attempted. If needed, Dr. Bakhtyari will suggest replacement of any dental restorations after the bleaching is completed so that your restorations will match your newly whitened natural teeth. Teeth whitening is not permanent. Regular brushing, flossing, and dental visits will help your maintain a bright, beautiful smile. Follow-up whitening appointments are required in most cases – more often if the patient smokes or drinks tea, coffee, or red wine. If you are interested in teeth whitening, and live in the Herndon, Oakhill, Reston or Northern Virginia area, feel free to ask Dr. Bakhtyari or one of our hygienists about treatment offerings during your next consultation or call today for an appointment!